When you feel like your world is caving in, RUN into your prayer closet and BE STILL in the presence of your Daddy God! When confusion overwhelms you and you do not know what to do and where to go, RUN into your prayer closet and SIT STILL on the lap of your Daddy God! The pressure and stress of life comes when you think you’re living your life alone and facing everything by yourself. BUT BE ENCOURAGED for the Lord you God is in your midst and He is with you ALL THE TIME. When I said, “RUN INTO YOUR PRAYER CLOSET” is when you get yourself out of the chaotic atmosphere of loose thoughts and begin to focus into the reality that He is as close as the mention of His name, JESUS. Call upon Him and He will answer you and show you great and mighty things which you don’t know. (Jeremiah 33:3) That’s worship! When you give Him His worth in spite of what you’re going through, that’s worship! When you acknowledge Him that He is in your midst, that’s worship! 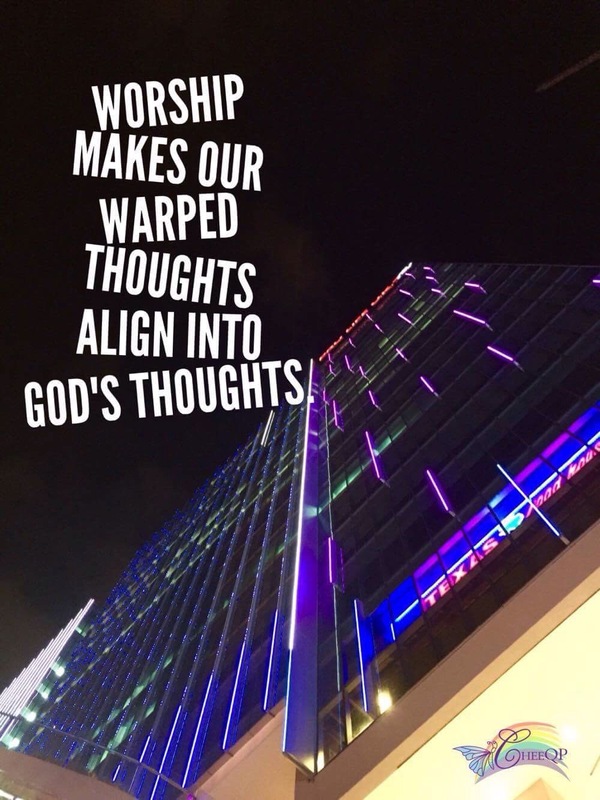 Worship makes your warped thoughts get aligned into God’s thoughts for in the presence of God, His still still small voice beco es LOUDER than your challenges’ noise. This is where re-alignment happens calibrating your thoughts to be in line with His. Therefore, there is NOTHING TO FEAR for His perfct love is demonstrated by Him constantly and consistently by BEING WITH YOU and ME.